The first hybrids and electric cars were the sweatpants of vehicles. Sure, they did the job, but you didn’t really want your friends to see you in them. Now there’s an entirely new crop of hybrids, as comfortable as a lounger and sharp enough to be parked in front of a country club. You can buy a vehicle running on kilowatts today that may even be faster than any other car on your block. Call it green luxury. And if you’re looking for a very stylish way to save the planet, we have found your new car. Davie is about two miles ahead on I-595 when something unexpected happens: a break in traffic opens up. Stepping on the accelerator of the Tesla Model S has two immediate effects: First, something close to whiplash (a legitimate tweaked neck that may take a few ibuprofens to fix). Second, in about a second, 89 mph somehow flashes on the speedometer. It’s easy to have unintended acceleration in electric cars, which, unlike gas cars, have all of their power ready whenever you are. That’s especially true in the Model S, a car that recently beat a Corvette ZR1 in a drag race (yes, it’s on YouTube). But the Model S has a lot more to boast about, like a 266-mile electric range and trunks in front and back big enough to make a Buick owner blush. There’s also technology that actually adds to the driving experience. The touch-screen display, for example, is probably as big as your first flat-screen TV and features what may be the only digital system easier to use than old-fashioned knobs and buttons. It’s surprisingly easy to pick up: the web search window and navigation use Google, meaning you already know how to use them as soon as your finger touches the screen. I try to think of any complaints I have about the car. I can’t. Oh, the wiper/turn signal stick is a little hidden behind the steering wheel; the otherwise comfy seats have only basic adjustments for a six-figure car; and the rear-facing third row stowed in the trunk would barely hold a couple of hobbits. But you’ll forgive these shortcomings, and in return you’ll have a comfortable car capable of unadulterated speed that will never require a trip to a gas station. It doesn’t take long to realize the Model S does more to advance the idea of a car than few cars have advanced before. For those people, your ahead-of-its-time car has arrived. The glowing electric blue trim and tail lights that look like they’re meant to guide a rocket into a docking bay make it clear this isn’t just another sport ute. Inside, BMW imagined a future with limited resources, so lots of surfaces are made with sustainable materials (such as dried grass used to make the dash). There’s also responsibly sourced leather and woods so handsome they look straight out of the backdrop of a menswear’s catalog. The electric i3 not only looks like it looped back from the year 2030, it drives like the car of tomorrow, too. Ease off the gas – uh, kilowatt –pedal, and the car begins to slow down, so much so the brake is really necessary only for emergencies. Get used to that and you’ll find yourself in a car that’s much peppier than powerful – and one that handles pretty decently for an upright city SUV. Get the optional gas engine to avoid worrying you’ll run out of juice before the next charge. Even if you do find yourself stranded, you’ll still be in the most futuristic fashion mobile on the road. In South Florida, many of us live in a bubble. You know, the sphere where you live and work, sometimes all within a five-mile radius. For you, the ELR is perfect, a sporty-looking city car that will rarely require a stop at the gas station. That’s not as true for anybody who likes to explore or has a cross-county commute. The ELR’s limited range of about 37 miles means a trip to Miami will have you switching to the gas engine on the way back. 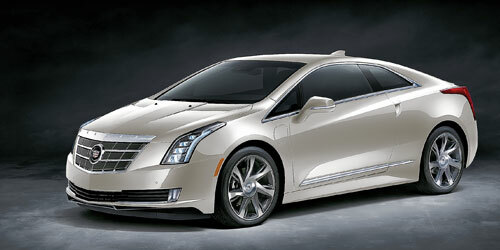 Still, the ELR is a looker – a sleek quiver of arrows, aiming down the road. Inside it’s all sports car, with a couple of back seats that could maybe accommodate a pair of dachshunds. The interior is a jumble of suede and leathers on nearly every surface and features a couple of seats as comfortable as anything in the luxury class. It would be hard to find a more silent car; even when the gas engine kicks on, it’s as quiet as a monk’s birthday party. If you have a relatively short commute, and you want to do it in the calm of a near-silent sports car, you’ll look good getting there in an ELR. Coral Cadillac, 5101 N. Federal Highway, Pompano Beach, 954-426-1800, coralcadillac.com; Ed Morse Bayview Cadillac, 1240 N. Federal Highway, Fort Lauderdale, 888-463-2950, bayviewcadillac.com; Vera Cadillac, 300 S. University Drive, Pembroke Pines, 954-362-9465, veracadillac.com. Nobody has been making hybrid luxury cars longer than Lexus, but you might not guess the GS 450h has an electric engine – along with a big V6 – stowed under the hood. This hybrid probably feels no different than the car you’ve been driving, as long as that car has a spa-quality cabin quiet enough to carry on a conversation in a whisper. It might be hard to find something you didn’t like in the GS, a car that accelerates well, handles around turns and is constructed of fine materials. Stylish wood, suede and leather abound, all arranged in tasteful simplicity. A dial on the center console allows drivers to switch over to all-electric mode, but it’s unlikely to work with the A/C turned full blast to South Florida settings. Instead, the “normal” mode will help you float through that commute in comfort, or the sport modes will firm things up enough to remind you that this is a sedan that’s actually more powerful than most sports cars. All that power is actually a good indicator of what you’ve got here, a hybrid that does not require any sacrifices. JM Lexus, 5350 W. Sample Road, Margate, 954-972-2200, jmlexus.com; Lexus of North Miami, 14100 Biscayne Blvd., North Miami, 800-692-9541, lexusofnorthmiami.com; Lexus of Pembroke Pines, 16150 Pines Blvd., Pembroke Pines, 954-443-2020; lexusofpembrokepines.com. There’s a beast hiding in the Panamera Hybrid. Drive this car in electric mode, like you have nowhere to go fast, and you’ll feel like you’re motoring around with a VW Beetle engine under the hood. Floor it and the gas engine comes alive, growling like any other gas-burning Porsche. This is not a ferocious beast, however; the four-seat hatchback is hauling around a bunch of batteries, which effects speed and fuel economy. All the extra weight means fuel economy averages about 25 miles a gallon; and Porsche fans may be surprised to learn the Lexus GS is just as fast. This is, however, a Porsche, and that means the kind of drive that reminds you that you’re in a car with a sports-car heart. The tight steering in sports mode feels eminently track ready. Of course, none of us should be racing away from stop lights. But in the Panamera Hybrid, it’s nice to know that you’re in a sure drag-race winner that also gets respectable gas mileage. Champion Porsche, 500 W. Copans Road, Pompano Beach, 954-946-4020, champion-motors.com.